Because of newly-minted constitutional limitations on the rate at which Indiana schools can tax property, more and more districts are likely to turn directly to voters to offset shortfalls in state funding. 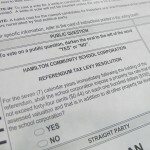 There are two types of school questions that can appear on the ballot in Indiana — construction referenda and general fund referenda. The former funds major facilities projects, including new construction and building renovation. The latter deals with school operating expenses, which can include everything from teacher salaries to transportation expenses. Between 2008 and 2013, 92 school questions appeared on the ballot in Indiana — and voters approved half. It’s not uncommon for districts to ask two or three times before voters say yes. Of the 14 districts that have pursued multiple referenda, six have made three or more appeals. Often, school districts scale back their requests the second time. That’s because for every 10 cents a district asks for, the referendum is one to two percentage points less likely to pass. Researchers say Indiana is still relatively new to school referenda, and it’s too soon to tell what impact elections will have on school budgets. But you can keep track of which districts have — and haven’t — passed their tax levy increases using our referenda scorecard. The November election isn’t only about politics. There’s a lot at stake for these public school districts, too.